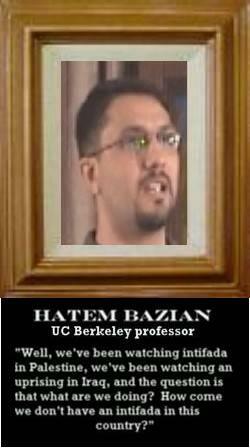 Hatem Bazian is director of the University of California, Berkeley’s Islamophobia Research and Documentation Project According to Bazain the Egyptians who oppose ousted President Morisi are doing so because they are anti-Muslim. No really he is blaming Islamophobic Egyptian Muslims for the ouster of Morsi. Of course the Berkley professor forgets that over 25 million Egyptians signed a petition calling for Morsi’s ouster, the vast majority of which were of the Muslim faith. To Bazian, protests of historic magnitude are signs of anti-Muslim bigotry. And what of Egypt’s military and security apparatus, which responded to the people’s wishes, and are dominated by Muslims? Islamophobes! How about Sheikh Ahmed al-Tayeb, the grand imam of Al-Azhar, the highest clerical authority in Sunni Islam, who blessed Morsi’s removal? Muslim hater! Implicit in Bazian’s analysis is the idea that only the Muslim Brotherhood represents authentic Islam, and those who acted against it are somehow un-Islamic. That goes for tens of millions of Egyptian Muslims. After a 2002 Students for Justice in Palestine rally at UC Berkeley resulted in the arrest of 79 protesters, Bazian spoke at a follow-up rally protesting the arrests. “If you want to know where the pressure on the university [i.e., to prosecute the demonstrators] is coming from, look at the Jewish names on the school buildings,” he said. Nice guy right? And his salary is paid for by Taxpayer dollars. According to this supposed man of learning the Egyptian revolt was instigated by fear of Islam. Egypt is a nation dominated by Muslims its military and its new government is dominated by Muslims. They all can’t be Islamophobic. Perhaps even they we protesting Morsi because of his ineffective rule. That is impossible per Hatem Bazian because if it isn’t Muslim Brotherhood than it can’t really be Muslim.